Capturing energy for POC21, the SunZilla team with their portable solar generator. Courtesy Michael Floyd. Many people feel overwhelmed or even paralyzed by the monumental environmental issues facing the world today. 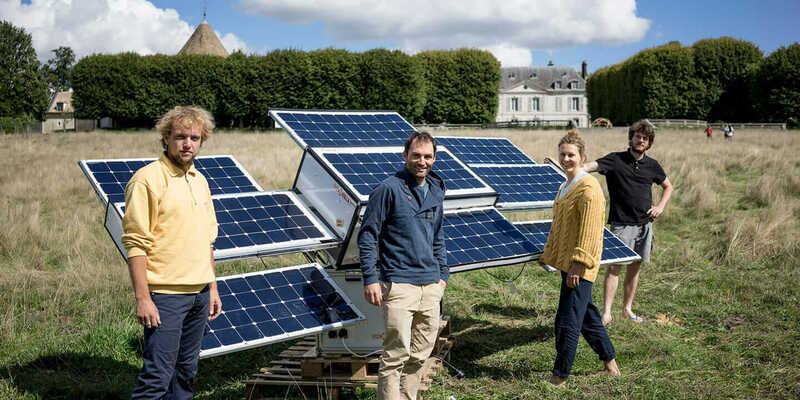 But a growing community is rising to the challenges and confronting them head-on with creative solutions—whether it’s an open-source DIY wind turbine, a fully connected greenhouse, or a water-filtration system for plastic water bottles. Environmental problems are providing fertile ground for open-source DIY, hacking, and problem solving. In this world, designs are invitations to collaborate. The new creators are not novices: They’re often skilled makers, designers, or engineers who have embraced a new, open approach to innovation. The global maker community is made up of people who are compelled to share their projects and insights—and even give up their designs and core intellectual property to get ideas out fast. 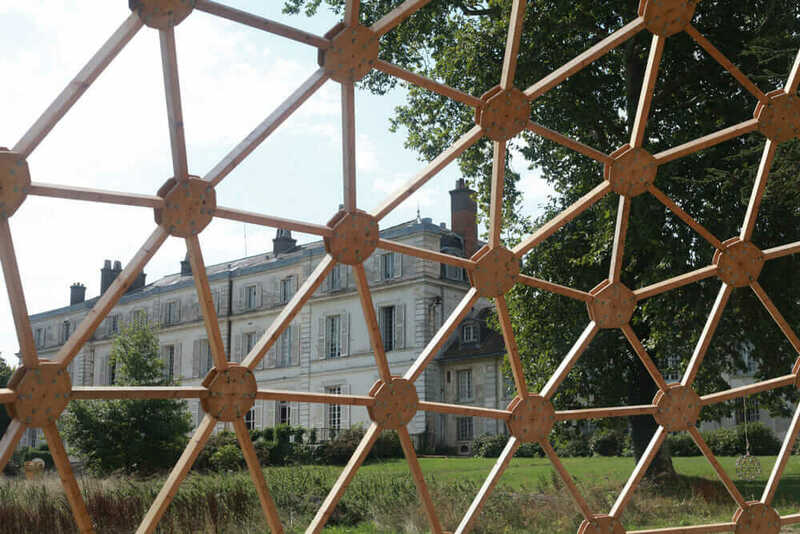 Occupying a 16th-century chateau outside of Paris, 100 of these innovators have gathered at the POC21 Innovation Camp for five weeks to advance open-source sustainability and products for sustainable living. Their ultimate goal is to ease society’s transition to a low-carbon, circular economy. The camp is also a response to the upcoming United Nations Climate Change Conference (COP21, held in Paris this December) to show that people are ready and capable of advancing their own homegrown solutions, even if governments and big business have been slow to act. Open Energy Monitor: This hardware and software monitoring system, created by a team in the United Kingdom, helps people better understand their own energy usage by measuring and visualizing electricity consumption and generation (as well as humidity and temperature) on a computer, tablet, or smartphone. The project’s founders see their system as just one component in the transition to a zero-carbon energy system, providing a smart energy layer that empowers people to make better decisions. 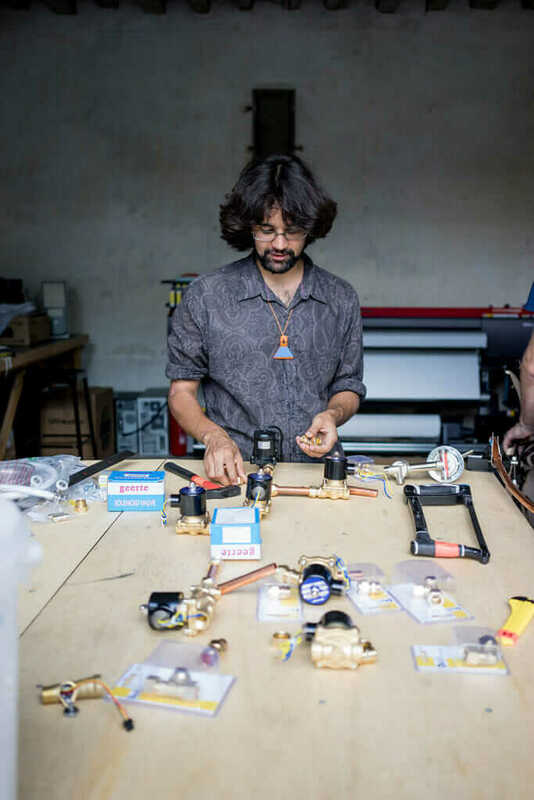 Jason Selvarajan of Showerloop cutting and assembling his components in the POC21 factory according to his PID (piping and instrumentation diagram). An empty glass shower stall stands in the courtyard, ready for the prototype to be installed. Courtesy Michael Floyd. 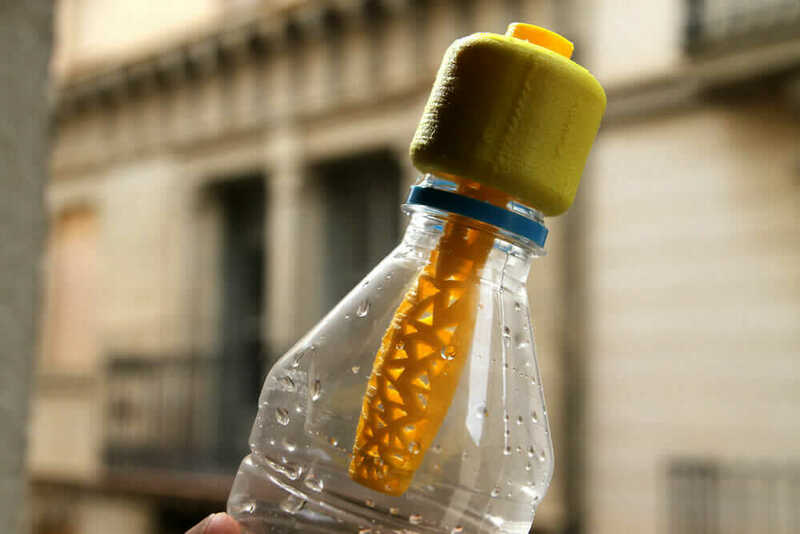 Showerloop: This water-filtration system cleans and recycles shower water in real time. Conventional showers are energy and water intensive, literally pouring precious resources down the drain. The system’s Finnish creator designed it to reduce the amount of shower water—and the energy used to heat it—tenfold. SunZilla: This mobile solar-power generator from a Berlin-based nonprofit is designed to replace conventional diesel generators at outdoor events (or in remote locations) with clean energy that is reliable, noiseless, and emission-free. The unit travels as a reasonably compact box, and its solar panels fold out from the top into a broad array. Digital design and fabrication, a familiarity with co-working, and a surfeit of information online have made it possible for the POC21 makers to install a fully functional pop-up makerspace. 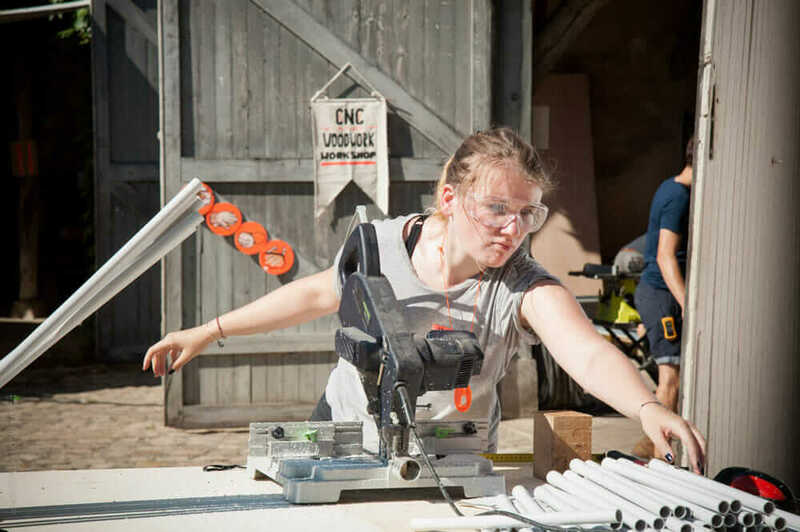 In a truly striking juxtaposition, an operational on-site “factory,” complete with CNC tools and laser cutters, has been assembled in a row of 16th-century stables and is now abuzz with project teams. Meanwhile, two 3D-modeling experts running Autodesk Fusion 360 software are at the chateau to train and assist the teams in modeling and refining their designs. “The experience itself is a proof of concept, demonstrating that 100 people can live and create together while accelerating their projects,” Danby says. “The hackathon model doesn’t work well for real design problems, since design and iteration take time. Five weeks allows time for projects’ designs to transform. Examples of sustainability and impact in the Maker Movement, which evolved during a period of mounting environmental crisis, are starting to appear all over the world. It’s no surprise, given that the world is faced with widespread social and ecological stress, and public awareness of problems like climate change is at an all-time high. At the same time, the means to produce physical goods have never been so accessible. During the past year, more than 800 makers submitted projects to Instructables in response to energy, sustainability, and electronics upcycling challenges. Winning entries included an atomic-force microscope made with used DVD and watch parts, as well as numerous DIY solar and wind projects. Especially when it comes to creating sustainable solutions that are affordable and accessible to many, there’s an inherent value in being passionately open source and radically transparent. With open-source technology, users are free to build, modify, and improve upon a given solution, and users typically share their work freely back into the community. 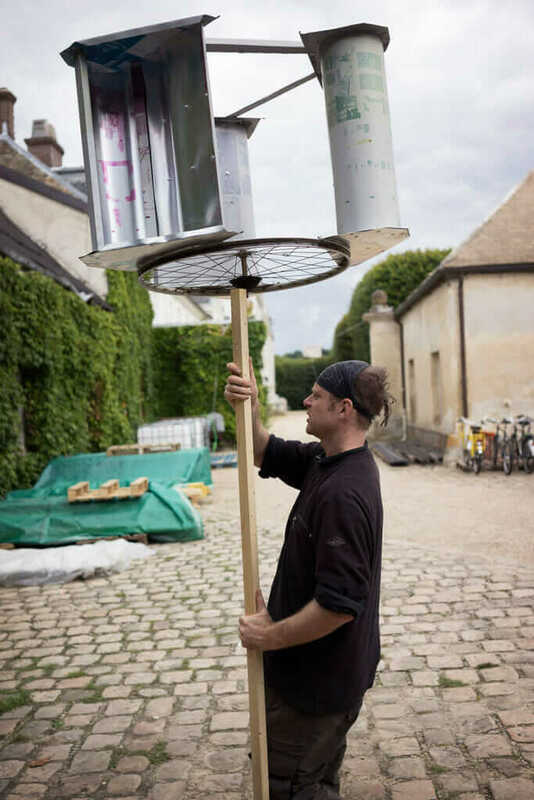 Moving first of six intended prototypes of the $30 Wind Turbine out of the workshop and into the field. The parts for this unit’s blades were hand cut from salvaged aluminum offset-printing plates. The next batch of blades will be the first of this design to be cut using CNC tools. Courtesy Michael Floyd. Some of the projects are open-source versions of an existing technology, like a solar concentrator or a water-recycling shower. These are already on the market, but the projects at POC21 are designed to be replicated by anybody, using a simple set of instructions and tools.